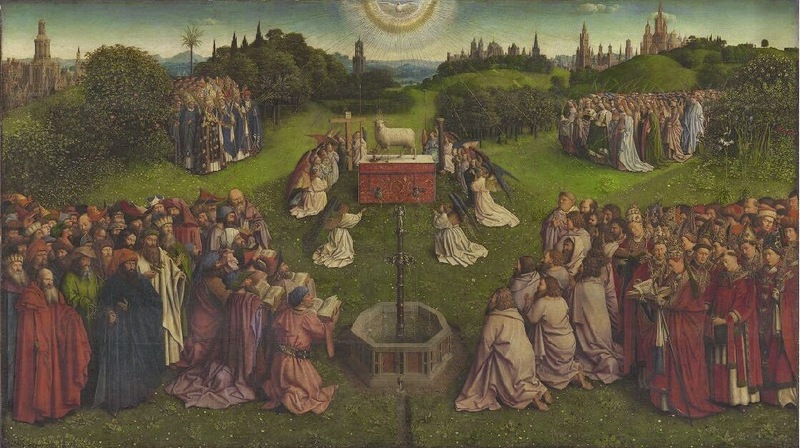 The hymns chosen for the Solemnity of All Saints emphasize our Communion with the Saints. Although, as Paragraph #960 of the Catechism of the Catholic Church (CCC) points out: "The Church is a "communion of saints" (Acts 9:13; 1 Cor 6:1; 16:1), the term "communion of saints" also refers to the communion of "holy persons" in Christ who "died for all" (CCC #961). Therefore: "It is not merely by the title of example that we cherish the memory of those in heaven; we seek, rather, that by this devotion to the exercise of fraternal charity the union of the whole Church in the Spirit may be strengthened. Exactly as Christian communion among our fellow pilgrims brings us closer to Christ, so our communion with the saints joins us to Christ, from whom as from its fountain and head issues all grace, and the life of the People of God itself" (CCC #957).